This entry was posted on June 20, 2007 at 1:22 pm and is filed under Validation. You can follow any responses to this entry through the RSS 2.0 feed. You can leave a response, or trackback from your own site. This is a lovely site. I found it through Katherine Misegades’ blog. 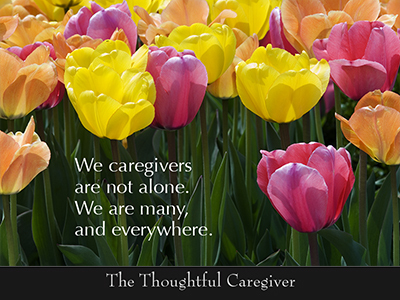 I’ve already passed the link along to a friend who is a caregiver. My dear cousin, Katherine, is also the reason I found this site. She sent me the book you and your daughter wrote and she illustrated. It has been so helpful. I am in the process of being a caregiver for my terminally ill best friend and husband. Thank you, for your insights. Hello, I am a soial worker; love the picture; may I use it with reference on a oage that provides support to grandparwents who take care of their grandchildren?